The second category of stick vacuums has all the qualities of the first, but is also able to vacuum well on thicker carpet. This takes a lot more suction power, and requires a much better vacuum. This category of stick vacuums usually comes with a variety of attachments, to help you clean stairs and furniture. Usually, these stick vacuums are anywhere between £55-£110. The third category of stick vacuums virtually replace your regular, upright vacuum. They have a tremendous amount of suction power and are able to pick up debris no matter what type of surface you are using it on. They are both lightweight and often are cordless, maximizing their ease of use and efficiency. These vacuums are expensive, ranging from several hundred pounds all the way up to £500. The best stick vacuum will depend on your specific needs. Many use a stick vacuum to add to a closet near a high traffic area, such as the kitchen or living room. At the end of the night, you can quickly get it out and clean up the area of your home with the most dirt and debris. In this case, you will probably want a lightweight, cordless stick vacuum. You don’t need one that can handle thicker carpet or stairs. If you want to use the stick vacuum on your entire home, you will need to evaluate how large your house is, and what types of surfaces you have. If you have thicker carpet, make sure to choose a stick vacuum that has a brush roller that is specifically designed to work well on a carpet. And, if your home is large, you probably want a corded stick vacuum, so your vacuum doesn’t run out of power half way through cleaning. If you are looking at a stick vacuum to be your all-in-one vacuum, you will want to go with a high priced one. Make sure the vacuum has enough features to be able to handle everything you want to use it for, such as vacuuming your stairs, your furniture, and even your car. Dyson and Shark make some fantastic stick vacuums that can virtually do it all. 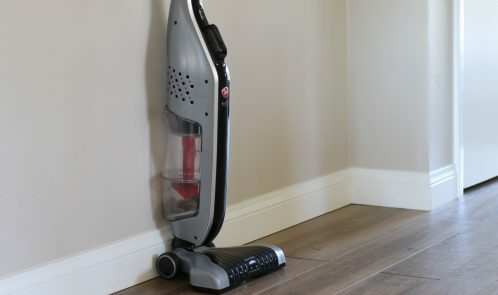 A great cheap stick vacuum is the Bissell 3 in 1. This vacuum is extremely lightweight, coming in at a mere 4 pounds, and does a great job on hardwood floors and light carpet. This model has a 16 foot cord, so you never have to worry about running out of battery power. Many find that having a stick vacuum helps them keep their home cleaner, because it is far more convenient to vacuum. To learn more about which stick vacuum is perfect for your home, you can visit http://thestickvacuums.com. I don't really think the higher end stick vacuums are worth it, unless you're rich or something. You can get a normal vacuum that's just as good for half the price or less. The cheap ones are really good for hard floors though, especially if you have kids that are constantly making a mess and getting crumbs and bits of food all over the floor all the time. It's so much easier to just vacuum them up really quick than to have to constantly sweep. thanks for the comment. I like the idea of the stick vacs as they are handier and take up what would be redundant wall space otherwise. Having to haul the vac out of the cupboard often means I don't clean up as often as I should.